I'm not a big fan of breakfast. Oh, I eat in the mornings, for sure, but breakfast foods and I have never really gotten along. Just ask anyone whose house I spent the night at as a kid. They might not remember much about me these days, but I betcha they'll remember one fact: I can't stand eggs. I'll pretty much eat anything you stick in front of me, even if I don't like it, but not eggs. At least not when I was a kid. These days, I'll possibly force down a few if I'm a guest at your house, but that's only if there's nothing else to fill my plate with. So what do I like to eat best in the mornings? So finding something to eat in the mornings was never really a problem. I've always just heated up whatever I find in the fridge, which takes all of 1 minute and 45 seconds, perfect for my lazy self to deal with. However, ever since Gv started needing to eat food all day that my body didn't manufacture, my go-to breakfast foods of choice haven't worked out quite so well. Sure, there are plenty of times she's on board with the rice and beans from the night before, but this girl likes her breakfast. Yogurt (with my homemade granola), oatmeal, grits, waffles, and yes, eggs are all high on her list in the mornings. Not really a big deal, because none of those things are too difficult to make (remember, I'm lazy! ), but none of those things get me really jazzed, so I usually end up fixing her something and then melting some cheese on a slice of bread and calling that my meal. Not exactly the best way to fuel my body for a day of chasing after my little Energizer Bunny. So I've been trying to come up with something that I can make that's breakfasty enough for Gv, but at the same time, not a standard breakfast food. Enter the world of smoothies. Sooooo many options and soo many good things to dump in. They're super-easy to make - and super-easy to eat - you just slurp it down while you're getting your morning going. Usually I whip up a pretty boring combination of ingredients: yogurt, bananas, berries, various spices, grains, seeds and powders, along with some milk or whey to liquefy it better and make it slide down the old gullet faster. But the other day, I made something truly special. It's just the thing for this time of year, when everyone's brain turns to cinnamon and spice. The only problem is, Gv and I have been enjoying these milkshake-like treats so much, our apple budget has gone through the roof. Good thing they're still in season right now. So give this applesauce energy smoothie a try for yourself. It's ridiculously easy to make and will fill your belly with all sorts of wonderful nutrients sure to stick to your innards and fuel your body for a busy day! 1. Dump everything into a blender, Ninja (like I use), or whatever else you have on hand to mix and pulse things up into a liquid. 2. Drink it all up, then go do those five things that you know you won't have the energy for in the afternoon, when the sun has drifted behind the clouds and your warm flannel sheets are just calling your name. And don't be afraid to play around with the amounts of everything - or even omit some of the ingredients, because I know not everyone will be as weird as I am about adding in all sorts of crazy grains, powders, and seeds! What's your favorite thing to stick in a smoothie? I'd love to hear! Either leave a comment below or email me at lisahealy (at) outlook (dot) com. 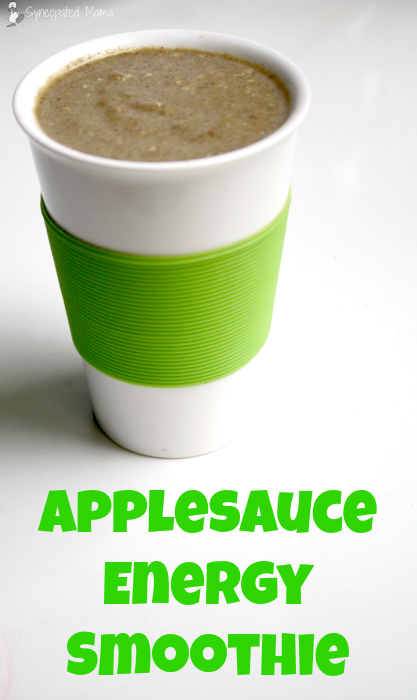 I have never seen applesauce in a smoothie before, but it's intriguing! Right now we are doing spinach, frozen strawberries, banana and avocado, plus peanut butter powder, chia seeds, and milk. 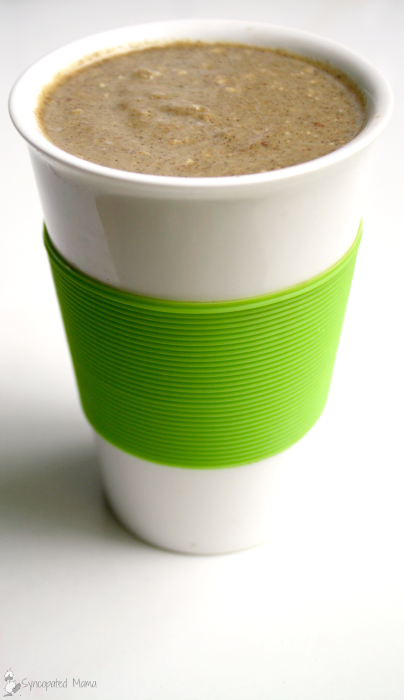 I've been playing with the idea of adding a hemp based protein powder. That peanut butter powder is awesome though, it adds flavor and protein without a lot of fat or "heaviness" - they had an organic one at costco for a while and I was loving it, but they seem to have stopped carrying it, boo that. I make a smoothie very similar to that except I use whole apples. I never thought about adding oatmeal. That would keep me satisfied a little longer. Thanks for the idea. This sounds yummy. Thanks for sharing on Littles Learning Link Up last week. Merry Christmas! I'll have to make this for my son; he's not a breakfast lover, either! Thanks so much for sharing!